New Game! 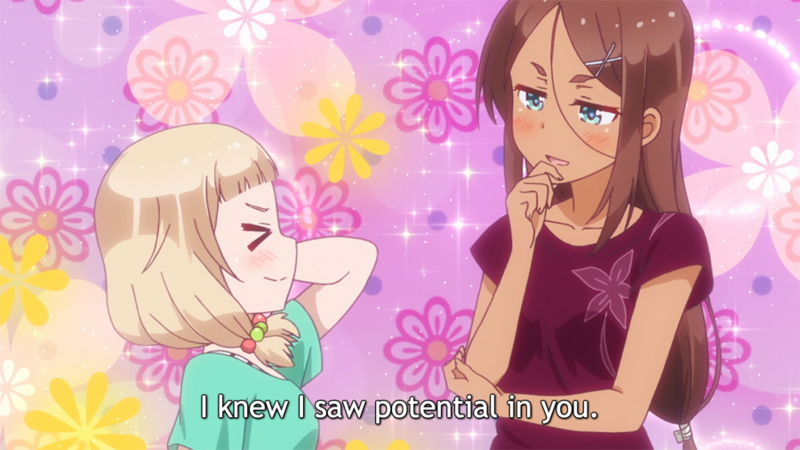 is my favorite accidentally feminist anime—in an effort to populate the series with only cute girls and have them explore yuri relationships, it’s a show that features an all-female video game company that makes games for exclusively female gamers. My favorite character is Nene, who has undergone some impressive character development this season. 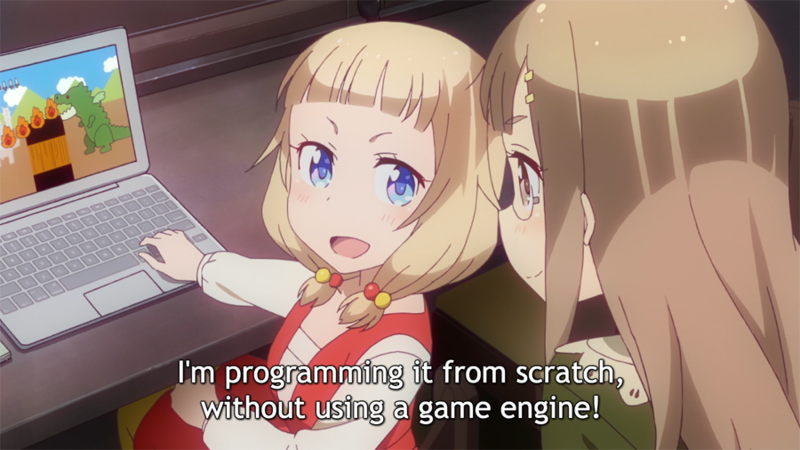 After leaving her Eagle Jump temp gig as a debugger, Nene goes back to college and decides to build her own game from scratch in C++ without using a game engine. With the help of some dog-eared library books, she builds “Nene Quest” from the ground up, not only programming all of the code, but drawing her own graphics, too. As she continues, she seeks feedback (well, mostly praise) from classmates, friends, and her former temp boss, Eagle Jump’s lead programmer Umiko. For Nene, the best-case result of a finished program is hopelessly intertwined with validation from other people. I’m not a C++ programmer, but I, too, am self-taught and I definitely saw ties between Nene’s work and mine as a web developer. 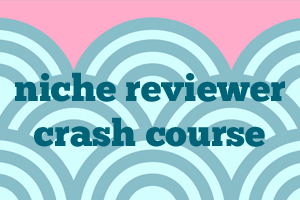 I know the pain of having one errant curly brace crash your project. I especially found Nene’s approval-seeking very close to home. Earlier this week I had an especially bad work day in which I had to deal simultaneously with a WordPress issue and with another WordPress developer talking down to me. It’s not so much that I resented him for doing so; it’s that I don’t have enough confidence in my own abilities to say I didn’t deserve to be treated like that. I didn’t get a Computer Science degree. I lack the intellectual and theoretical aspects of a degree, and my skills are narrowly focused on the tasks I’ve had to implement in the real world. I have weird gaps in my knowledge, like sometimes I don’t recognize the correct term for a type of function, even if it’s one I regularly write. Nene’s skills aren’t where Umiko would like them to be, but Eagle Jump still hires her on a trial basis. Unfortunately, the approval she craves is short-lived. 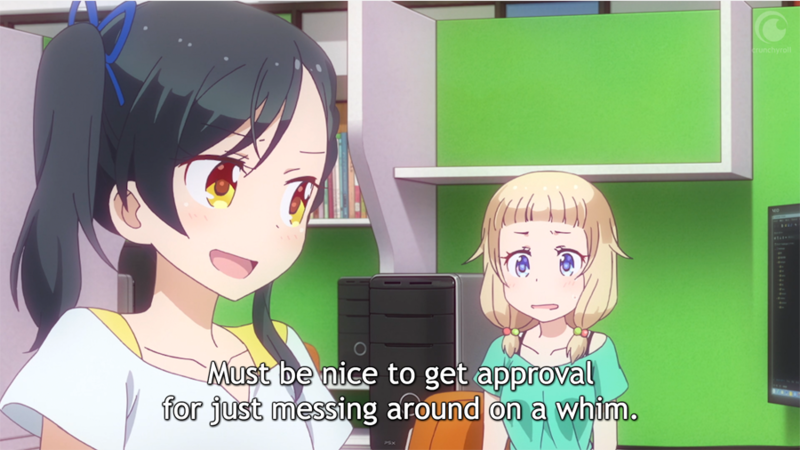 Her new colleague, Naru, has been studying programming since middle school and is mildly incensed that Nene started learning “on a whim” and accuses her of getting hired only because Umiko knows her. It hurts to see Naru drill into Nene like this, but Naru is right. Nene’s skills are impressive for just four months of practice, but she needs to put twice as much effort in to keep up with everyone else. One of the best podcast interviews I’ve ever done was for Code Newbie, where I talked about being an amateur programmer. Two years later, I wrote about the imposter syndrome I’m still struggling with. Like Nene, I’m able to do my job, well even if I put my mind to it. But I’m not that talented. I Google solutions daily and sometimes seek help from other developers. I can’t do it alone, so I have a hard time allowing myself to feel like I deserve any praise. I was wondering how Nene’s concerns about her comparatively low skills would manifest at an all-woman company. In our world, women are few and far between in tech jobs, which adds another layer of anxiety for me—I sometimes feel like I’m constantly serving as a representative for all women. 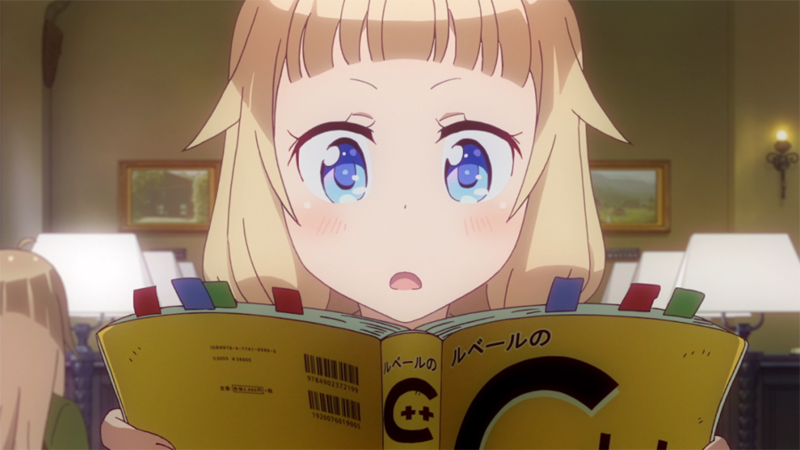 Since New Game takes place in a world without men, Nene doesn’t deal with the anxiety of being a minority. Instead, her female coworkers are the instigator she needs to excel, even if it doesn’t always feel that way to her. Naru’s prodding and Umiko’s guidance (and potential praise) help Nene push her impulsive, fun-loving tendencies aside to put her all into her work. I feel the same way: working with other people keeps me from getting too down on myself or too stagnant in my work. For a self-taught developer, a support system is a great way to determine whether your skill level is too low or outdated. And for a developer who might not be able to find validation internally, Nene can earn it through showing her hard work off to her mentor. The second season isn’t over yet, but I’m thrilled to see how far Nene has come. I especially love that she’s not a genius and she’s not always as focused as she should be—but she’s always respondent to feedback, even if it isn’t positive. Nene’s story shows me that maybe it’s not such a bad thing to rely on friends and mentors a little. Whether you’re self-taught or educated, none of us really does it alone. Listening for not only praise, but tough-love critique, can help us get better, no matter what skill level we’re at. New Game! is streaming on Crunchyroll. My little sister recognized Death Note’s Misa instantly from my Netflix queue. “That’s the girl you used to draw all the time!” she exclaimed and darned if she wasn’t right. I was in my freshman year of college back then, but I was home for every break, doodling anime characters in the corners of my biology notes. Misa was especially iconic, a goth in pigtails who defined the next five years of lazy anime convention cosplay. She’s the crux of Death Note’s surprisingly sincere love letter to a specific era of Japanese goth-rock aesthetic. After the train wreck that was the Netflix Death Note live action, I’m rewatching the anime again. So different to see it in high definition rather than pirated pixels on a bad DSL connection. I’m shocked at how little I remember. And after my sister’s comment, I realized I barely recognize the person I was when I first saw it, during my freshman year of college. When I came home for winter break from college, I hardly recognized my own home; my parents had redone the kitchen in granite and put a pool in the backyard. My little sisters already looked different from the photos I had of them on my dorm room desk. At college I had been a little homesick, but back here I already missed my dorm and my new friends. I was in between homes and I didn’t know where I belonged anymore. But anime has always been there for me during times like these. I remember watching Death Note because I used its labyrinthic, thriller plot to escape my problems. I related most to Light—not his sociopathology, but the way he increasingly isolated himself, drawing inward while slowly, the outside world become wholly uninhabitable to him, populated with people he couldn’t relate to or trust. An overdramatization of my own withdrawal, sure, but great TV for a girl who felt kind of lost. Rewatching it now, the best moments are the scenes that prod my memory; that not only force a reaction, but the knowledge that I’m reacting differently to it now than I did 10 years ago. Back then I was as old as Light, L, and Misa are, and they seemed all the more intimidating for being my peers. Today, I feel so much more compassion for how young they are. Today, I feel so much more sympathy for my former self, watching this to escape her own loneliness. I have these mental triggers for so many other shows. I’ve discussed how Welcome to the NHK helped me out of a depressive episode I went through while job hunting. 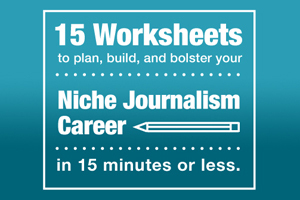 I shared how The Devil is A Part Timer reflected my transition to freelance. Honey & Clover will always make me think of my budding relationship with John (it was the first anime he ever recommended to me), and though it wasn’t the first time I’d seen it, Nerima Daikon Brothers will always make me think of how I used to blast those peppy musical numbers after fights with my parents, tears still streaming down my face as I sang along. Less notably, Masamune-kun’s Revenge got me into weight-training (Masamune is a fitness nut). This isn’t unique to anime. When we read a book or watch TV or look at art, ourselves come flooding into the experience. Anime is ostensibly an escape, but when we show up to process what we’re seeing, our own narratives are what help us put this story in context. Our surroundings as well. I was so surprised my sister remembered my drawings because until then, I didn’t consider the way my experience watching Death Note affected the people around me. Can you separate a show from the person you were when you watched it? I don’t think I can. Rewatching a show is less about revisiting a storyline than looking for glimpses of that girl who watched it first, the person I used to be. Misa in disguise, Death Note episode 13. Fandom is better when you’re old. This weekend I tabled at the Massanutten Regional Library in Harrisonburg, VA. It’s John’s hometown, and his mom invited me to come talk to kids as a published author. I wrote that book in seven weeks and don’t earn royalties on it, but the library carries it, so I went. I didn’t know what to expect, so I brought stuff for kids of all ages. I converted the Otaku Journalism cover into a coloring page with crayons. I printed out Anime Origin Stories questionnaires. I brought my Cell, Naruto and Sasuke models for kids to play with. This was not a big event—maybe 200 people attended, and maybe 50 stopped by my table. I had some memorable interactions, like being able to tell a Dragon Ball Z-loving mom about a couple anime with black characters, like .hack//Sign. Most kids flipped through the cosplay book and quizzed me on whether I’d seen different shows (the most popular show with this demographic seems to be Sword Art Online). But at the end of this meet and greet all I could think was that, man, fandom is so much more fun for me now that I’m an adult. There was also the nagging feeling that I was disappointing my family. As the oldest sibling, I felt like a bad role model for having hobbies my younger sisters considered “uncool.” My parents also just wanted me to try harder to fit in. And then there was the uncomfortable factor of my discovery of anime paralleling with my coming of age—if you read my anime origin story, you know about the shirtless Duo Maxwell poster I drew for my room. My poor mom walked in, looked at it, and walked out. Eventually my parents grounded me for a month for looking at slash fanfiction, so I can’t really blame them when, even after I found a chaperone and saved my allowance for months to go to Otakon, they forbid me from going. Instead they dragged me along on a day trip to the beach, and all I remember about it was my sister barfing in the car. Today, my life is incredibly different. I go to several conventions every year. Anime is cheap and easy to get and I watch a lot of it—I am subscribed to Crunchyroll, Funimation, Netflix, and Anime Strike, plus I have a dozen Right Stuf Blu Rays on pre-order. I have since bought everything I torrented. Don’t torrent—you’ll eventually have money and feel guiltily compelled to support every show you pirated, and my taste as a teen was not very good. Better yet, I now live with my anime fan husband who doesn’t just accept my hobbies, but engages in them with me. Instead of keeping our fandom hidden, we have bookshelves full of anime and manga and a highlighter-yellow cabinet of Gunpla, which the repairman always stops to look at—he loves Transformers, he says, but hasn’t seen anything like this. I also have a lot of supportive friends. Once, I brought a college boyfriend home to dinner, and somehow the conversation devolved into he and my family all poking fun at my anime obsession. Today, I’m too old for that crap. I have friends who don’t like anime, but none who bother me about it. There’s also the fact that my job involves anime a lot of the time! 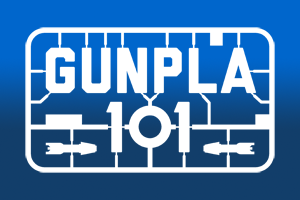 Sometimes I actually review anime and build Gunpla for money, and I’m still not over that. I don’t ever miss being a kid. While some people remember the freedom of zero responsibilities, of never having to work or pay bills, all I remember is the emotional confinement. I remember feeling like if I wanted to be who I was and be into what I was into, I’d be disappointing people. I don’t know if this is actually true—today my parents seem as impressed as my mother in law in the fact that I got a book published—but I certainly felt like a big letdown of a daughter. And I remember the feeling of it lasting forever and ever, because I didn’t know any differently. I couldn’t envision a time where I wouldn’t feel guilty and repressed. At the library this weekend, it was young teens I resonated with the most. 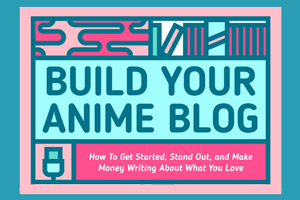 A girl asked me about how she could write an anime magazine, and I don’t think she believed my advice about starting a blog for starters (I guess today, teens are into YouTube more). Two 14-year-olds asked me how expensive it is to go to Otakon, and when I told them a weekend badge costs $80, they said it was out of the question, not to mention convincing one of their parents to take them! Another kid told me he wanted to get Crunchyroll Premium, but he would need to use his mom’s credit card and he wasn’t sure he could convince her. It made me realize that even with anime and fandom so ubiquitous today, it still isn’t that accessible to people under 18. I wanted to look these kids in the eye and say, “Just wait 6-8 years. It’ll be awesome,” but of course I couldn’t. Back when I was a young teen, every afternoon felt like a lifetime. There’s nothing I can do for teens today, but I’ve been glad to see the way that Anime Origin Stories has been helping to dispel the loneliness people felt when they were young fans. I have more than 30 complete (15 posted now), and some of the most impactful stories are the ones about how anime inspired people to feel less alone, whether it helped them to find their people, escape a traumatic home environment, or simply become more confident in themselves. If I could go back in time and tell my teen self one thing, I’d say “be patient.” She might not believe me though. The difference between anime fandom when I was a kid and now isn’t about accessibility, or what shows people are watching, or convention culture. It’s about mindset. Back then, I don’t think I could have imagined that rather than being the cause of my teenage loneliness, anime fandom would be its cure. 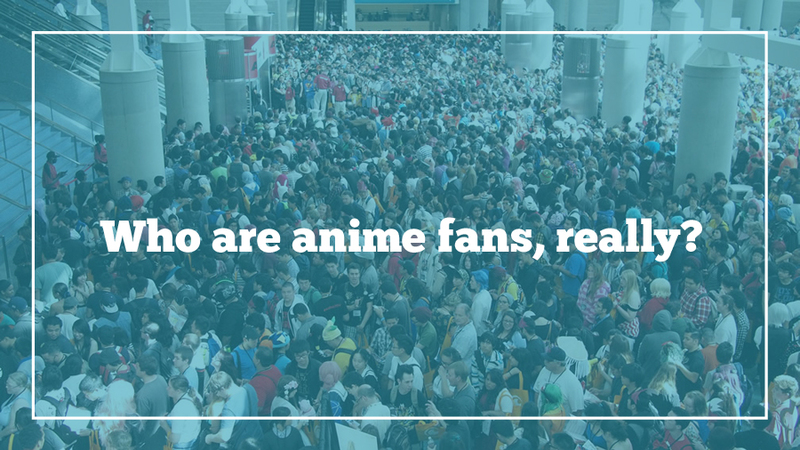 Who are anime fans, really? Our ties to the alt-right. Last week, I had the dubious honor of getting quoted in the same news article as Nazi Richard Spencer. Here’s Why There’s Anime Fan Art Of President Trump All Over Your Facebook is Buzzfeed’s Ryan Broderick’s attempt to make sense of the undeniable ties between anime fandom and the alt right, and figure out why that might be. As usual, the answer is a lot more complicated than anyone expected. My take boils down to this: long before they were hotbeds of politics, sites like 4chan were initially created for talking about anime. When alt right rhetoric began to pop up on the forums we used to talk about anime, we were already there, hence the cultural intermingling. While I think the Buzzfeed article tells an important and interesting story, it is still trying to depict a particular narrative, one that isn’t mine. I stand by my quote, but I don’t feel that the lead-in of “bored young men” is accurate for a few reasons. So let’s talk about it. The alt right is overwhelmingly male, but are anime fans? “I’ve never met a female anime fan in real life,” reads an Anime News Network comment in 2007. For me, this is a surprising statement, since my anime fan history is overwhelmingly female. In middle school, I watched Revolutionary Girl Utena and Serial Experiments Lain at slumber parties. When I attended the historically all-female University of Mary Washington, our anime club was majority women. My husband, John, became the first male anime club president in school history during our senior year in 2008. So whose experience is closer to reality, that forum commenter’s, or mine? It’s difficult to find anime fandom demographics, so I had to conduct my own study. In 2015, I requested demographic data from North America’s 10 largest conventions, and six responded. At all of them, women made up about 50% of attendance. On the other hand, here’s a survey of Reddit’s r/anime community conducted in 2014. Only 7% of anime fans on that forum are female. In other words, what the data I collected really tells us is that when it comes to in-person anime gatherings, women are better represented. In any case, anime creators seem to be hyper-aware of the idea that many disparate audiences consume anime, and they separate these by demographics. The categories of anime we know best—shounen, shoujo, seinen, josei—all refer to a specific age and gender demographic: boys, girls, men, women. That’s not to say that people only watch anime that matches their demographic, only that this is the initial marketing attempt. In the lead-in to my quote, I take almost as much offense to the precursor “bored” as I do to “young men.” Who doesn’t hang out in online forums because they’re bored? Instead, I think the overlap between the alt right and anime comes from anime fans’ computer literacy. Forums like 4chan and Reddit have their own rules and idiosyncrasies. They take some experience in order to get up to speed with. You know what else is similar to that, at least until recently? Finding and watching anime. In other words, watching anime has long required a higher computer literacy than most Internet use requires. And its pirate legacy means the fandom has somewhat seedy origins, too. So I think anime fans are more comfortable than most people about hanging out at forums others might consider an online underbelly. The kind of places that alt right recruiters might go to spread their messages on the down low. The Buzzfeed article focuses on young radicals who also love anime. That’s one story about an undeniable and fascinating sub-group of the fandom. But of course, most of us anime fans don’t fit into that group. We can like One Piece and not become radical nationalists, too! My anime fan sub-group is in fact much different than the one in the article. Our politics tend to be liberal and accepting. The anime conventions I attend have things like gender neutral restrooms and introvert quiet areas. 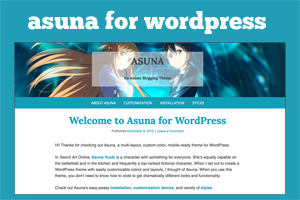 I also am part of a group blog called Anime Feminist. And even today, my community consists of mostly female fans, not male. Anime fandom is made up of many, many smaller groups with many, many disparate views. But it’s much easier to just attribute one set of characteristics to all of us. Ultimately, that’s why I thought it was vital to contribute to the Buzzfeed article. If we ignore the way we’re represented, then somebody else will gain control of the narrative. 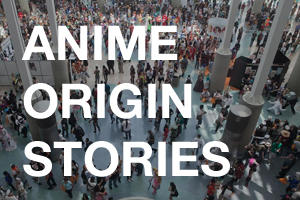 Convention attendees at Anime Expo 2014, credit. 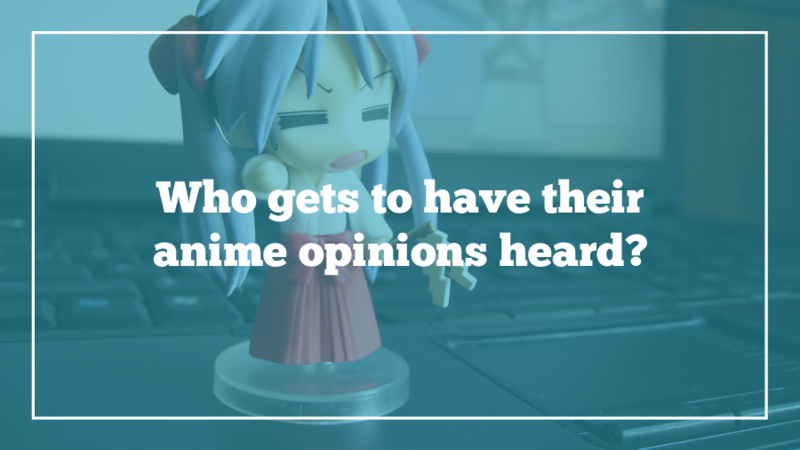 Who gets to have their anime opinions heard? So there you have it. I’m old, I’ve been writing about anime for over 7 years now, and I’ve worked with a lot of different people so I’m well connected. Want to be selected to judge neat stuff? Don’t stop writing about anime for almost a decade and that could be you. I was the person picked for the job. But am I the BEST person for the job? Definitely not. I never took a film criticism course in college. I don’t speak fluent Japanese. I am not an expert on sakuga or any other facet of how your anime sausage gets made. 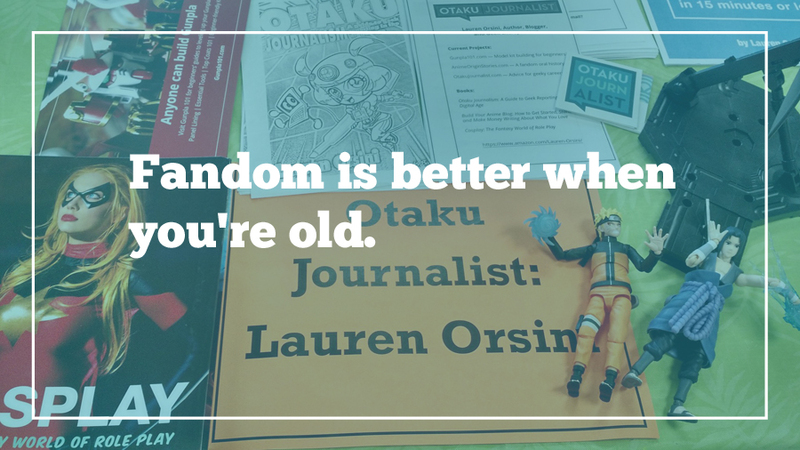 I am just a girl with opinions, opinions that have kept getting louder and louder as I applied for (and picked up) work at Anime News Network, Otaku USA, Crunchyroll, Kotaku, Forbes, and more. As a result, the Crunchyroll Anime Awards have been met with some criticism. A lot of fans, including people I count among my friends, have been doing “write-in” votes because they don’t see their own favorites among the four selections for each category. I get that; not all MY own favorites got picked. Here’s what I submitted to Crunchyroll, which was then pooled with the six other judges’ picks in order to get the selection you see on the Anime Awards. Keep in mind this was blind voting—I didn’t sit down with LeSean Thomas and compare notes or anything. It was a group of seven people choosing their subjective favorites. YouTube anime reviewer Digibro recently suggested that these experts, and the most established anime bloggers in general, should be the people with the loudest voices in his video “On the Need For A Cabal of Anime Gurus.” (He later expanded on this viewpoint in detail on Josh Dunham’s Senpai Coast to Coast.) The downside is that this looks a lot like gatekeeping, implying that some voices are more valuable than others. If that became the accepted state of things, I probably never would have started anime blogging. I struggle with imposter syndrome and I wouldn’t have ever felt like I was good enough. Here’s why I do think I’m good enough—I’m persistent and reliable. I have been vocal about anime several times a week for almost a decade now. I didn’t start out educated about anime, but experience and reading other reviewers has made me better. 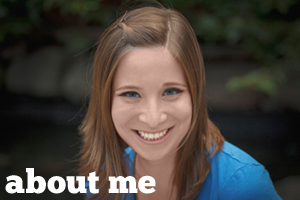 I also think that by adding my voice to all the others out there, I bring my own experiences to the table. As it turns out, that’s the thing I value most in the anime reviewers I admire myself. I love reading about the nitty gritty of animation—stuff like how the art director planned a show’s ED, or how Yuri on Ice doesn’t have a higher than usual budget behind its ice dancing choreography. But what I value even more is my favorite reviewers’ individual viewpoints on a show. I want to hear Isaac justify why he likes shows other people think are uncool because I think he has a unique perspective. I like Reverse Thieves’ joint reviews because I think their friendship with each other is just as interesting as the way they rate shows. Not to say that these reviewers aren’t educating themselves about anime more and more all the time, but I value their opinions, how they relate to these shows as people, most of all. And I want anime bloggers just starting out to know that no matter their anime knowledge level, they have an incomparable perspective on anime that’s unlike any other out there. “I want people to be more educated about anime,” Digibro told Josh, and that’s a very laudable goal, and due to our language barrier with Japanese anime creators, the misinformation he speaks out against is definitely a problem. But I definitely think there are different degrees of being into anime, and there are people out there who just want to enjoy shows without thinking too hard about them. I think that leads to a pretty forgiving audience for anime blogging, one that cares about why you thought it was an episode worth watching, even if you didn’t know who the episode’s sound designer was. That would be an interesting detail, but it’s not enough to build a review out of. For me, opinions are still valuable. After all, there’s no way to objectively rate the best anime of the year, or else seven judges picked for being “respected voice[s] in the anime community,” as my Anime Awards Judge email read, would be able to accurately predict fan favorites without anybody doing write-ins. If you’re on the fence about sharing your anime reviews because you don’t think you’re good enough, or anyone will read and find value in them, I’m encouraging you to think again. Your passion for anime is already giving you license to write helpful, entertaining reviews.